By Mark MaskeHundreds of protesters gathered outside Mall of America Field here Thursday to voice their objections to the Washington Redskins’ name before the team’s game against the Minnesota Vikings. “We call this a walk, not a march, and this is a walk to raise the consciousness of people with regard to racism in sports,” said Alan Yelsey, who identified himself as an organizer for the American Indian Movement. “We’re certainly trying to change the name of the Washington team. That’s the focus. But you have a mix of people. You can see hundreds and hundreds of people from all walks of life here to look for respect for all people. And the name of the Washington team does not convey respect. It’s illegal and it damages children. 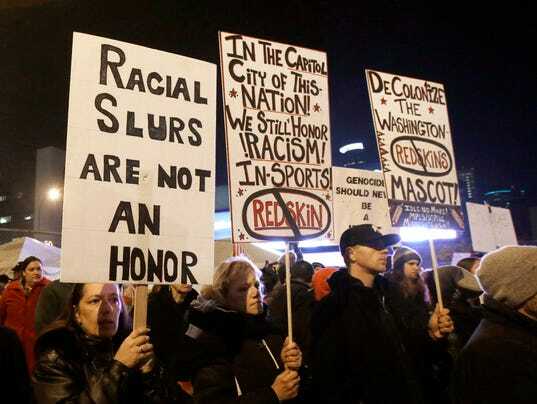 The group that gathered here Thursday evening was far larger than similar protests to the team name when the Redskins played in Green Bay and Denver earlier this season. (aerial photo) Yelsey said the group was “over 700, approaching 800 people” and was “right in the line with what we were expecting.” He called the reaction of people walking by on their way to the game “100 percent” supportive.Hundreds rally outside Metrodome to protest 'Redskins'Krystal Hedemann, 34, of St. Paul, a member of the Leech Lake Band of Ojibwe, said it's time to get rid of what she called racist names in sports. "I want my children to grow up in a world without racist names," Hedemann said. Former Minnesota Gov. Jesse Ventura spoke to the crowd, saying he always tried to avoid saying "Redskins" when covering the team as a sports broadcaster. "This name is wrong. It's just plain wrong," Ventura said. He asked what would happen if a sports team in Birmingham, Alama, was named "The Slaves" and had an African-American mascot. "Redskins" = "Little Red Sambo"
By Arturo GarciaAmerican Indian Movement co-founder Clyde Bellecourt renewed Native Americans’ call for a name change for Washington D.C’s professional football team on Friday, telling Democracy Now anchors Amy Goodman and Juan Gonzalez that if owner Dan Snyder knew the history behind the term “Redskins,” he would do just that. Both Goodman and Bellecourt pointed to a Thursday night protest at the team’s game in Minneapolis, Minnesota as evidence of the increasing public demand for Snyder to change his team’s name. Members of the Minneapolis City Council also publicly slammed the team name at a press conference the same day. By Brian DaffronFrom your own personal perspective, what were your reasons for joining the Minneapolis protest? It’s time for those individuals and those teams who think they’re honoring us to recognize that we bring honor to ourselves and our tribal nations. In honoring our tribal nations, we bring honor to America. I think it’s time for the owner of the Washington Redskins, for example, to bring honor to himself--by changing the name of the Washington Redskins. This is the latest flare up in a decades-long fight over the name, a racial description for indigenous people that many find offensive.